SAILORS' SECRET -- One of the best kept secrets in the Valley is the Arizona Sailing Foundation's (ASF) Junior Sailing Program. Located on Tempe Town Lake, the program holds fall and spring classes for children ages 8-12. One of the best-kept secrets in the Valley is the Arizona Sailing Foundation�s (ASF) Junior Sailing Program. Located on Tempe Town Lake, the program holds fall and spring classes for children ages 8-12. The classes are taught in Optimists � a boat designed especially for kids. The Optimists, nicknamed "Optis," are basically like a bathtub with a sail. The classes are designed with many kid-friendly games such as racing for a candy-covered buoy or building miniature sailboats out of junk to race along the shore. Designed to handle one skipper, the Optis are a proven boat for learning the basics of sailing. Optis self-right easily and perform well even in the lightest of winds. Students in the program learn how to sail upwind, downwind, the parts of a boat, and how to right a boat. ASF is also responsible for a burgeoning high-school sailing program, a youth Laser team, and an extensive Learn To Sail program for adults. The junior sailing class is $175 for six classes and runs on Sunday afternoons. Pre-registration is necessary. 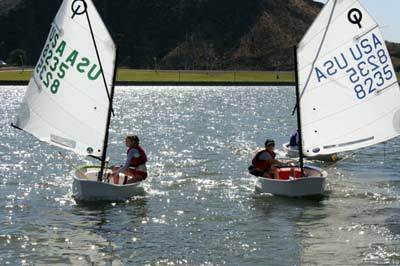 Currently, there is a fall session and a spring session, but the City of Tempe, in partnership with ASF, hopes to offer a summer sailing camp as well. For more information on any of these programs, visit www.AZsailing.com or call (602) 955-2881. For those interested in racing small sailboats, The Arizona Yacht Club has a race series on Tempe Town Lake.